Online portal BPOCareerHub.com (BCH) is pleased to announce the re-launch of its website www.BPOCareerHub.com. The initiative to improve the site was meant to simplify the web user’s experience as well as help position BCH as a highly relevant online enabler for the Information Technology-Business Process Management (IT-BPM) industry and more. There is still much to be done but BCH is very much on its way in helping more Pinoys find and get their dream jobs! 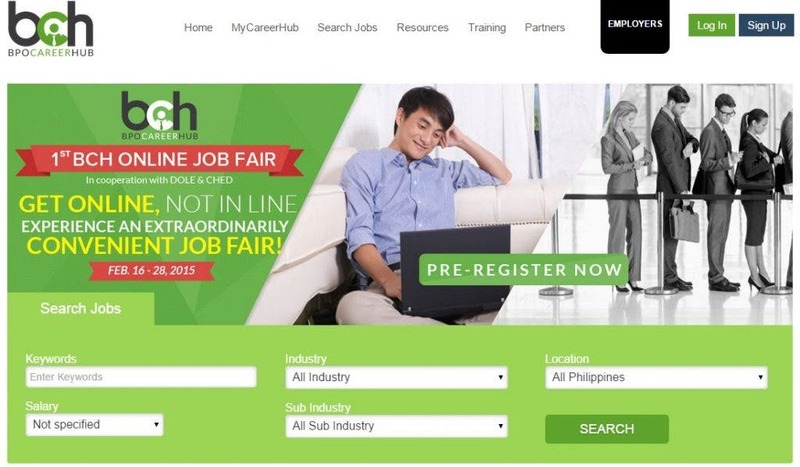 As one of its initial treat, BCH will be holding its 1st BCH Online Job Fair on February 16-28, 2015 (http://bpocareerhub.com/OnlineJobFair) – in cooperation with the Commission on Higher Education (CHED) and with the Bureau of Labor and Employment – which will virtually connect and require “less prep time, less effort, and less resources” from jobseekers and recruiters alike. Go to http://bpocareerhub.com/faq to learn more about this new and exciting event. To date, there are already 18 participating companies – and several more are expected to sign-up soon – that are looking for the top talents that will help boost their operations. Hundreds of jobseekers have already pre-registered and hundreds – if not thousands – more are anticipated to join the online job-hunting bandwagon soon. Another ground-breaking Virtual Solution which BCH will be introducing in 2015 is the Virtual Interview service. The Recorded and Live versions intends to simplify and shorten the talent recruitment process further. Once invited by an employer to a Virtual Interview session, the jobseeker may do the interview in his most convenient time and virtually record his answers to the interview questions. The recruiter, on the other hand, will simply have to view and review the recordings and invite for further processing those candidates who made it through the initial screening. BCH anticipates that the market will quickly take up on the Virtual Interview because of the employers’ need to make quick hiring decisions as well as the jobseekers’ desire to immediately have gainful employment. Innovative products and solutions will be developed, introduced, and shared by BCH this year as it aims to become the primary online enabler of IT-BPM industry and more. Jobseekers, employers, partners, and other industry enablers and suppliers can expect more features and enhancements that will provide more convenience and business opportunities. For more information visit www.bpocareerhub.com. LIBERTY: A Shot of Ecstacy this August 25, 2012 at Ford Global City Building!